In preparing Rktcr for release on Steam, I've been making some minor adjustments to the code and art (Steam Achievements! Blinking characters!). As I've made a bit of a fuss about before, Rktcr is a game that plays exactly the same across three compiler/OS combinations (g++/Debian, clang++/OSX, cl.exe/Windows). As such, part of any update is confirming determinism with an extensive test suite. Specifically, I have the game compute SHA1 hashes of relevant state as it plays itself on a hand-crafted set of ~1,600 par time paths. Yes, there are over 1,600 individual paths segments you might want to play in Rktcr, and I have a plan to add cheat-proof leaderboards for all of those. But that's a topic for another post. I'm pretty sure that the one-second difference between VS updates is within noise, though I dread that it may be a performance regression. Turning optimizations off demonstrates that they are at least doing something. Under Linux, there is a noticeable improvement between the steam-runtime-targeting g++ 4.8 and my system-wide g++ 4.9; whether it's a compiler or standard library difference isn't clear; but it is certainly nice when newer compilers make old code faster. Finally, I'm surprised that the Windows/VS version is doing so poorly compared to Debian/g++ -- my previous experience has been that cl.exe produces code that is a fair bit faster than either g++ or clang++. I'm left wondering if this particular code is something that cl.exe fails to optimize properly, or if the Windows stack is failing somewhere else (filesystem read performance? standard library implementation?). There could even be exotic hardware causes -- Windows and Linux are run from different [though identically-branded, purchased-at-the-same-time] SSDs -- perhaps one is slower. My rainbow-driving game, Rainbow (available for iOS and Android for approximately $1) has been nominated for a Pocket Gamer award in the "Most Innovative" category. 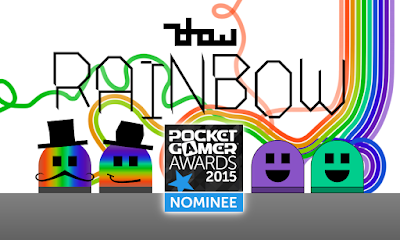 Please head over to Pocket Gamer to vote. It's almost certainly not going to win, but one must try, eh? Each year, my brother and I spend the new year's eve building a new album to release. Also, I've been trying to get in the habit of releasing a little interactive solstice / new year card around the same time. So here they are. Some highlights: Weird To Me -- a classic one-take Jimike song; Undone -- all sorts of interesting sounds in here; Intro -- really energetic track. Some lowlights: weird mixing in Great In The Future; She -- a track that is perhaps too mellow. We are starting to accumulate a fair bit of audio gear. This year's album involved two guitars, a banjo, a Monotribe, three mics, and two different midi control devices -- a keyboard and a Push (run through a custom script to make it nice for use in Reason). As always, expect Spotify links when we get around to pushing the files to our distributer. Last week, I received a disturbing bug report from an iOS 8 user: Rainbow, it seems, wasn't properly saving any game state. So, I sat down to see what the problem was. Hmm. A hardcoded path. That seems brittle. And that seems to have done it. Expect a 1.5.2 version of Rainbow to appear soon.